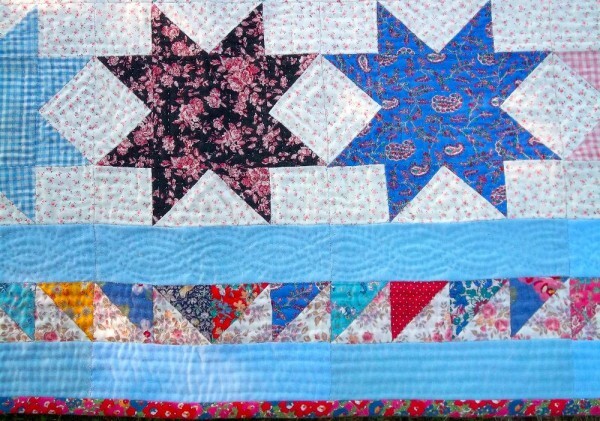 There are several different ways of making a star patchwork quilt but the eight point star is particularly satisfying. This is made from a mixture of Viyella (wool and cotton) and Liberty Varuna (fine wool); the border has a few triangles in a Laura Ashley brushed cotton. 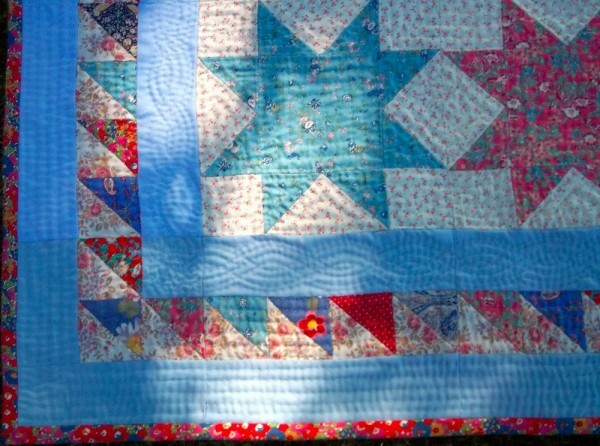 The background is pieced from remnants of baby dress fabric – some are little blue rosebuds on off-white, while most are the pink version of the same fabric. Several of the fabrics of the stars themselves are remnants from the hand smocked dresses I made for my daughters. All the pieces were folded over papers and all sewing was by hand, including quilting, This quilt is not on a bed. I have it hanging over the bannisters at the top of the stairs as I know from a double axe-head quilt I made in the same fabric that it doesn’t wash very well. The axe-head quilt was on a bed for years but after frequent washing, the colours clouded over and looked very dull. I didn’t want to chance it with this one. The quilt is 240cm by 240cm (8′ by 8′). Each star is 28cm (11″) across. Viyella in its original blend is no longer available but it has an interesting history. This twill weave first appeared in 1893 in England and was developed to be shrink resistant, with a mix of 55% merino wool:45% cotton. Fine and warm, it was ideal for children’s nightgowns and was the fabric of choice for shirts for those in the armed services. The fabric handled well and was easy to sew, by hand or by machine. A Viyella nightdress replaced the flannel nightdress beloved of the Victorians. Clydella (81% cotton:19% wool) came much later and was named after Clydeside where the factories producing it were located. Viyella is said to be the first branded fabric in the world but although the name lives on in a fashion company, there is now no longer any association, other than nostalgic, with the fabric itself. Liberty Varuna is a very fine 100% wool fabric which is still available, although it is true that you don’t often see it in small prints such as those used in the quilt. Today it usually comes in more sophisticated prints made up into women’s clothes, and especially shawls and scarves. It is a bit more scratchy to wear than viyella and would be a bit too uncomfortable (and expensive) next to the skin for children’s nightwear. I think some of the Liberty fabrics are a cotton and wool mix -see the blue paisley star above – but I can’t remember what it was called. At the opposite end of the quilt scale comes the following miniature star quilt made from tiny scraps of my favourite Liberty Lawns, and Laura Ashley, Designers Guild and Souleiado cottons. The border is a particularly much loved scrap of a Liberty sweet pea print. The tiny roses on a nearly black background was one of Laura Ashley’s best. As well as the background, it came in yellow, pink and a very useful mushroom colour. I had some of them all. Today a few scraps remain and, as tiny remnants call for tiny quilts, I think I shall have to make more miniature quilts. The rose pink squares with the tiny leaf print are Souleiado. For a few years there was a shop selling Souleiado fabrics on the Fulham Road. I don’t know whether they had a particularly good range then, but I have never again seen my favourite fabrics on sale in their Paris shop (which may no longer be there) or on the internet. 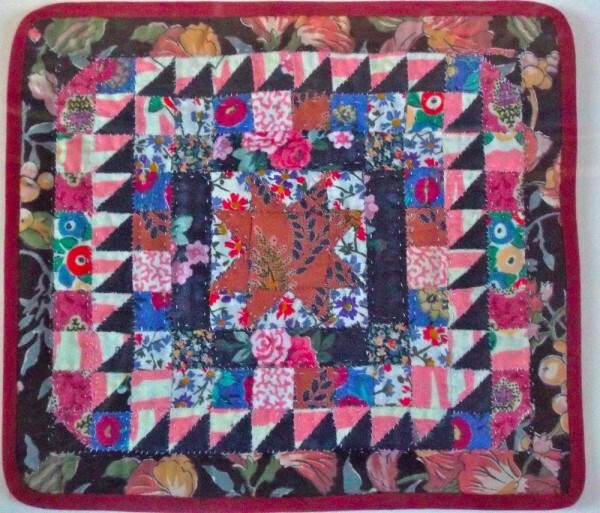 This quilt measures about 18cm by 20 cm (7″ by 8″). Each square was 1 cm before being sewn over papers. The photograph below is half the actual size. 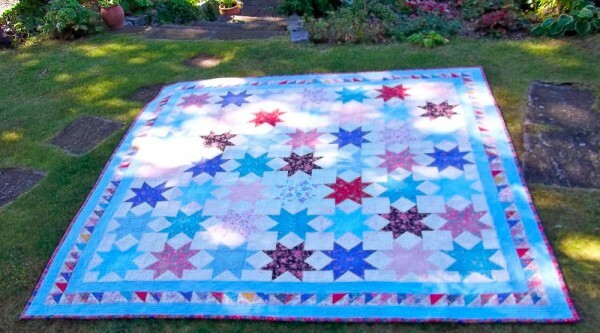 Miniature Star Quilt: mainly in Liberty Lawn. When daughter No 1 got married we decorated the marquee for the reception with 6 large quilts, including the 8 pointed star quilt. As I felt that speech-making should no longer be a solely male concern, I said a few words about why we had a marquee full of quilts and what some of them meant to us. Rather like Steven Poliakoff’s thought-provoking film ‘Shooting the Past’ which told the story of past lives in photographs, I realised you could tell her life story in fabrics. There were the baby nightdresses and smocks, the dress worn to her first day at nursery school, summer frocks, winter skirts, dresses school photos were taken in, dresses for parties, dresses for family celebrations, dresses recreated as dolls’ dresses, teddy’s dresses, and even the dress we once tried on the cat. Then there were fabrics from my maternity dresses, fabrics used in Miss Lorraine’s ballet shows, bedroom curtains and former duvet covers, fabric bought for school projects and even the old curtains (very beautiful where not faded by the sun) from a friend’s seaside cottage where we spent many sandy, sunny, silly summers. And I’ve left lots out. Suddenly, all those thousands of pounds we didn’t spend on flowers made sense. The quilts were not decoration but biography and their presence at the reception added to not only her story but theirs. We have so bamboozled my son-in-law (a political journalist) with our love of fabrics, and especially Liberty fabrics, that at times it has seemed to verge on brainwashing. Once, at a party he was introduced to someone who said she worked for Liberty. “Oh,we love that shop”, the dear innocent said. “No, not that Liberty. I mean the human rights organisation run by Shami Chakrabarti” came the surprised reply. Ooops. Really interested to see this. I have just unearthed a stack of viyella factory offcuts from the 1960s/70s and wondered if they would work in a quilt. Now I can see that they will! Yes they will work well but if the quilt’s for a much used bed, viyella seems to wear out a bit quicker than cotton.